One day, I was checking information about my company on Alexa, the Web site tracking service, when I noticed the Jigsaw logo on the company contacts page. Jigsaw is a business directory—the largest of its kind—where you can look up information on companies and their executives. You can use information in the Jigsaw database for everything from lead generation to recruiting to good, old-fashioned contact information. Contacts That Mean Business: SkyData for Jigsaw stores your recent searches for company contact data and other information from the Jigsaw business directory. And that’s where SkyData for Jigsaw comes into play. The free app from SkyData Systems promises access to company profile information for more than 11 million companies and executive profiles. 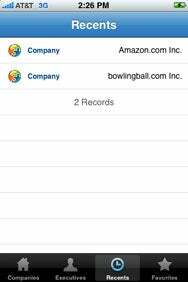 You can search by company or executives with the first two menu options at the bottom of the app’s screen. Once you find what you are looking for, you can easily add it to your favorite list for easy retrieval later on. SkyData also keeps track of all of the recent records you have looked at. These records show you Web sites, phone numbers, addresses, demographic data (revenue, number of employees), and much more. Within the record you can tap on the address, jumping directly to that address in the iPhone’s Maps application. Tap on the phone number to call the company. Tap on a Web address, and the page opens in Mobile Safari. SkyData for Jigsaw’s interface is very smooth and easy to navigate. For business users who belong to Jigsaw, SkyData has provided a great mobile client. SkyData for Jigsaw is compatible with any iPhone or iPod touch running the iPhone 2.2 software update.